In evergreen gardens Tea is picked by women mostly. The tea is harvested according to a certain distance of time (10-14 days) and harvest pattern (two leaves and one bud). Especially old leaves and too many leaves per bud are poor for the quality of the harvest. 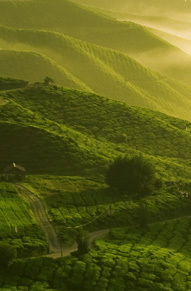 The higher the altitude of the tea gardens the better the quality of the tea. At sunrise the worker are already in the gardens, pick tea and throw the buds with the leaves in baskets on their back. A picker fills two to three baskets a day. That makes roughly 18-24 kilograms leaves and it results in four to six kilograms tea.